If internet users actually took a few minutes to sit back and take stock of the amount of information they extract from the world wide web on a daily basis I think they might actually be a little taken aback. The majority of individuals use the internet to learn and acquire information as well as seeking out and watching videos of cute puppies on YouTube. With sites like YouTube and Vimeo, search engine giants such as Google and free information hubs like Wikipedia; the internet really does have something for everyone and it is a very rare instance that you can’t find an answer to something you are looking for. For those who are always connected to a desktop or a notebook, quickly flicking between different search engines provides little fuss and can be done quite easily. However, the current boom in the smartphone and tablet industry means that more and more users are turning to their mobile devices throughout the day as their main access to the internet and all of the information it holds. Once upon a time, mobile users were limited to websites which had been specifically formatted to be used on WAP-enabled devices, thankfully this is no longer the case. Owners of an iPhone happen to also be benefitting from a jailbreak now have the option of downloading the WeeSearch Pro plugin by Jonas Gessner, who some may know from his Currency Converter or ProTube enhancements that can be found in Cydia. 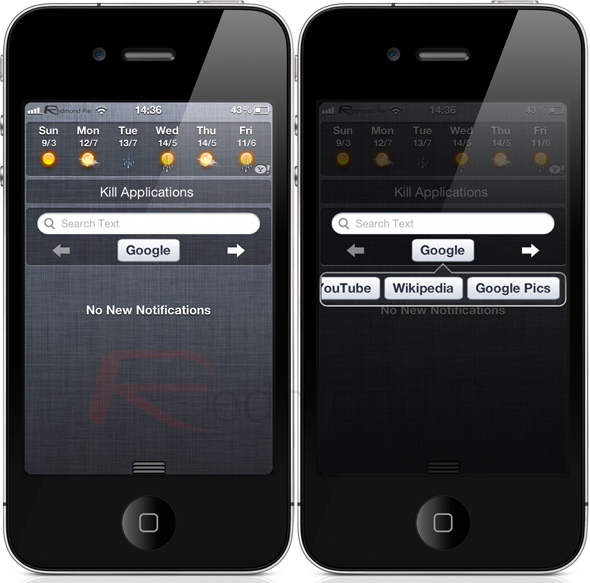 WeeSearch Pro is a Notification Center based tweak which, when activated provides users with a dedicated NC-based hub for all things search related. When activated, WeeSearch Pro puts a simple search bar into Notification Center, along with a handy selection of pre-defined sites to search for information on. The plugin comes with the ability to search through Google, YouTube, Wikipedia, Amazon, eBay, Wolfram Alpha, Yahoo, Bing and Google Pics which I would imagine would cater for the majority of people’s searching requirements. If that isn’t enough, WeeSearch Pro does offer the ability to enter a user-defined search engine which can be added through the ‘Manage Search Engines’ option in the preferences section of iOS. WeeSearch Pro also comes with quite a substantial set of configurable options which allow users to change how the tweak behaves as well as the aesthetics of it within Notification Center. One of the coolest features of the tweak is the addition of a very simple overlaid web view which appears through a page curled animation when the search button is pressed. This new view allows the results to be viewed before deciding whether to continue and open the results in Mobile Safari or dismiss and return to Notification Center. 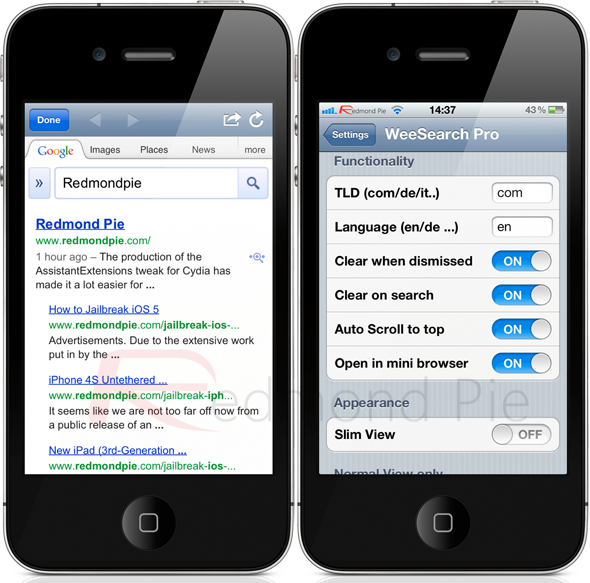 WeeSearch Pro is available from the BigBoss repository for $1.49 and requires iOS 5 or above. An additional back up utility is also available as a free of charge download which allows user-defined search engines to be backed up and easily recalled at a later date.